„Diversity“ seems to be all around us, but what does it really mean? What do people imagine when they are asking for a more diverse society? How can we approach aspects of diversity like gender, intersectionality, migration, or gentrification? What can we learn from communities worldwide? With you, we would like to discuss these and other questions on eight different tables. 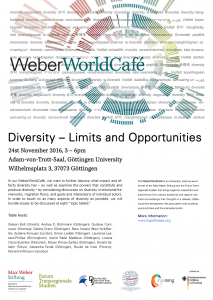 We kindly invite you to the WeberWorldCafé “Diversity – Limits and Opportunities”. It will take place on 24 November 2016 from 3 to 6 pm at Alte Mensa, Wilhelmsplatz 3 in Göttingen. The WeberWorldCafé is an interactive, biannual event format that brings together researchers and practitioners from various disciplines and regions who meet and exchange their thoughts in a relaxed, coffeehouse-like atmosphere. To enrich the discussions we particularly invite students, young scholars and the interested public to participate in the talks. 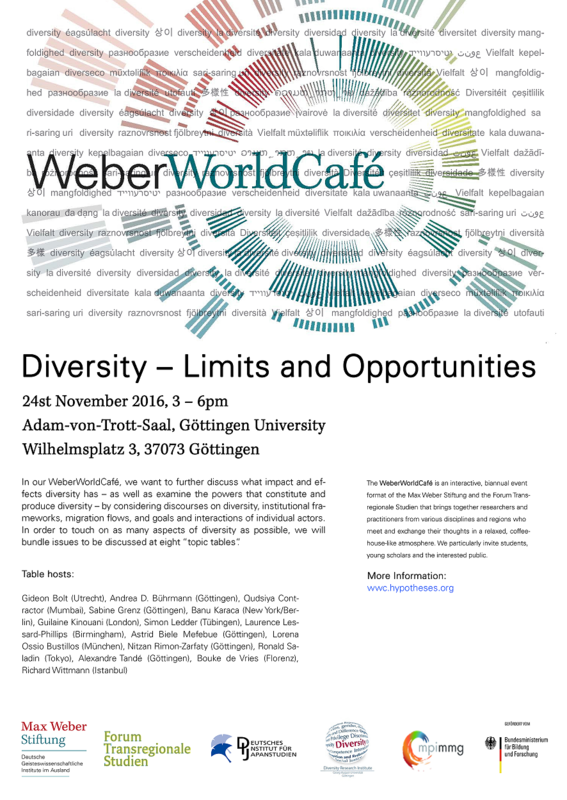 The WeberWorldCafé “Diversity – Limits and Opportunities” is an event hosted by the Max Weber Stiftung – Deutsche Geisteswissenschaftliche Institute im Ausland and the Forum Transregionale Studien Berlin in cooperation with the German Institute for Japanese Studies, the Diversity Research Institute of the Georg-August-University Göttingen and the Max Planck Institute for the Study of Religious and Ethnic Diversity. It is curated by Phoebe Holdgrün (German Institute for Japanese Studies) and Gesche Schifferdecker (Max Weber Stiftung).